Seeds | Listen Free on Castbox. Georgia is a changemaker, ex-lawyer and now CEO of Humanitix NZ, and she shares about building the world's first non-profit events ticketing platform backed by Google and Atlassian, the value of education and the power of community. In this interview we talk about her childhood, the value of community, the importance of vulnerability and being honest in her life and career. We also discuss her new role as the CEO of Humanitix which she began at the start of 2019 and we discuss the business model that leverages the power of booking fees to drive impact at scale for disadvantaged children in New Zealand and abroad. Humanitix: https://www.humanitix.com Ignite consultants: https://www.igniteconsultants.co.nz Global Shapers: https://www.globalshapers.org Youthline: https://www.youthline.co.nz "We are passionate about disrupting the events ticketing industry and redirecting 100% of profits from bookings fees to projects that address the education gaps affecting the most disadvantaged children here in Australia and overseas. We believe education is a ticket to opportunity and that every child has the right to reach their potential. Our projects aim to create a world where all children are born into a community where they can flourish and have the tools to create their own impact. We invite you to partner with us as we transform ticketing into a force for good." This bonus episode is all about impact and social enterprise in New Zealand. It was recorded on Friday 12 April 2019 as a live panel discussion at Te Papa. It was moderated by Steven Moe with Louise Aitken, CEO of Ākina Foundation, Professor Dana Brakman Reiser from Brooklyn Law School, Holly Norton co-founder and Chief Community Officer of Collaborate, Kay Maree Dunn, co-founder and CEO of Āhau and Andrew Phillips from Charities Services. The full audio from the conference will be released in a separate episode. For other stories visit www.theseeds.nz Session 8: Social Enterprise We live in a time when old and new paradigms of thinking are colliding. One example is the idea that charities are the primary way of “doing good” in our society, whereas business is about generating private profits. Social enterprise presents a new conception which seeks to combine both profit (traditional domain of business) and having positive impact (traditional domain of charity) through sustainable businesses. In this panel we will hear about the current state of social enterprise in New Zealand, how founders choose to become charities vs social enterprises, Māori perspectives on Social Enterprise, different legal structures used overseas andthe limitations for social enterprises wanting charitable status. Wil co-founded EPIC (Enterprise Precinct and Innovation Campus) a unique building which houses many start-ups and tech companies in central Christchurch. As one of the first buildings to go up following the earthquakes there is an amazing story behind the building which we discover in this interview. Wil also shares his background growing up in the UK and how he ended up in New Zealand. We also discuss what makes a good salesperson, key elements that make up a great team and what it takes to succeed as an entrepreneur. EPIC: https://epicinnovation.co.nz/ info@epicinnovation.co.nz TedX Christchurch talk: http://www.tedxchristchurch.com/wil-mclellan Bio from the EPIC website: Executive Director of Vision & Strategy at EPIC Innovation Eisenhower Fellow My work leading businesses development for large organizations in the UK and New Zealand, gave me the appreciation of the value of empowered collaborative teams working closely with clients – as one team. My work co-founding the Enterprise Precinct and Innovation Campus (EPIC) with Colin Andersen has now presented the opportunity to work with a vast array of global entrepreneurs, startups, SME’s, international corporations and Governments. John Page is a governance expert at BoardWorks. He is also the writer of a major research report "True to Label" looking at how value is measured in the non-profit sector in Aotearoa New Zealand. He has many years of governance experience in a variety of roles and in the arts which we discuss in the interview. Now in his role he works as a consultant supporting governing boards and directors in their leadership roles. https://boardworksinternational.com/about.php True to Label report: https://sportnz.org.nz/managing-sport/search-for-a-resource/news/true-to-label This is the 90th episode - for others visit www.seeds.nz "BoardWorks International is a long-established, leading board effectiveness consultancy with but one purpose - to support governing boards and directors in delivering outstanding and inherently satisfying boardroom leadership." Peter was the Dean of the Christchurch Cathedral at the time of the earthquakes in 2011. I chose to air this interview now because we talk about love and acceptance in this and it feels like the most appropriate interview given the Christchurch attacks which have just happened. In this wide ranging conversation we discuss his background in the UK, his studies at Oxford University and what led him to become a priest, how he ended up in New Zealand and his memories of the quakes. We also take time to reflect on spiritual 'thin places' where the distance between physical things and spiritual things is less thick. It has been explained as “a place where the boundary between heaven and earth is especially thin. It’s a place where we can sense the divine more readily.” This is the 89th interview and if you enjoyed this you might enjoy some of the earlier ones as well at www.theseeds.nz On reflecting about this interview I wrote this: Thin Places The thinnest of barriers separates us from wonder. From an understanding of love, waiting. As paper cannot be seen through yet we know it is so thin. Shine a light on it and see for yourself. Like the sun hitting a silver platter And reflecting into open eyes. Open to the possibility that your presence will be with us no matter which path is chosen. Or like holding a midnight candle held in the dark at a service more than 50 years ago. A moment in time. These encounters, unfolding elegantly, revealing within the very idea, that God is with us always. Inspiring hushed whispers. Look – right there! That sense of wonder rises filling us up to the brim from the inside. Seek out the thin places, point them out to others that love may grow. In this episode I share everything I've learned about how to create a podcast. This was recorded live when I gave it as a session at the Social Enterprise Unconference in Levin in mid February 2019. 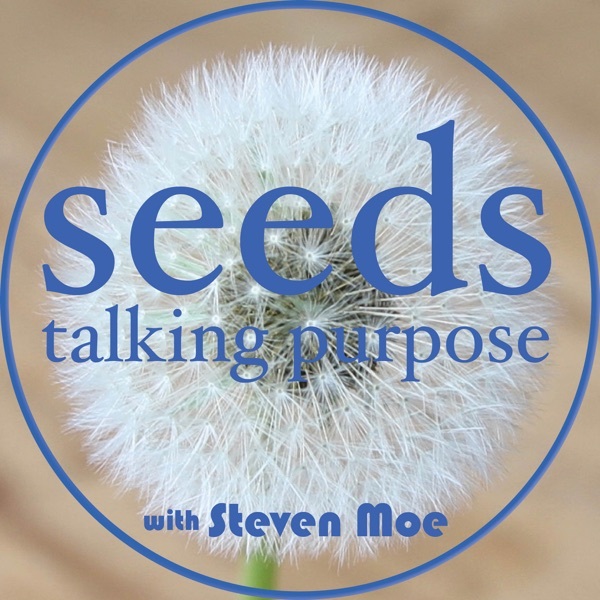 One of my dreams for seeds was to teach others so they could start their own podcast so if you are interested in learning more then drop me a line and happy to help answer your questions - steven@theseeds.nz. This is the 86th episode - if you enjoy it then check out some of the others, subscribe and leave a rating and review. Video of this session on the Facebook page and at www.theseeds.nz or at https://youtu.be/zQ0SN6bbcq8 Equipment and other things: • Audio Recorder, have a Zoom H4N Pro: https://www.zoom-na.com/…/field…/zoom-h4n-pro-handy-recorder • Two Rode Procaster Microphones: http://www.rode.com/microphones/procaster • Podcast hosting site, am using Libsyn: www.libsyn.com • For editing the interviews I use the free software Audacity: http://www.audacityteam.org/ • Pop filter for microphones reduces the “P” sounds: http://www.rode.com/accessories/ws2 • Two XLR cables to connect microphones to recorder: https://www.rockshop.co.nz/…/hosa-hxx010-male-xlr-to-female… • Got some cheap microphone stands. • Two headphones so you can both listen as you record with a headphone splitter so both plug into the device. • A bit of time! A few weeks ago, I sat down with Steven and had a solid, fun, recorded conversation on purpose and life. Steven recently published a legal handbook on social enterprises in New Zealand and has been doing interviews with entrepreneurs and social enterprises about their journeys on this podcast. Through mutual friends and overlapping circles we got connected quite quickly. I feel honored to have been invited to be on the podcast. The growing list of humans and their truly impressive set of accomplishments and contributions to earth and society are humbling. Steven masterfully guided the conversation from my childhood to teenager years as an immigrant, as he waives into it his own story and aspirations, and we move into my university days and during that the exposure to the greater world, its beauty, its problems, my craft, and my finding of sometimes-often bumpy pathways that have taken me where I am currently. I told him it has been years since anyone has dug that deep to my past-history and the aspirations that have been part of my constant evolution, and it was truly an enlightening articulation/process for myself as well. After our interview/conversation, I have listened to several podcasts with other interviewees and have enjoyed their stories, lessons, and journeys. I am looking forward to soaking up some more! I can definitely recommend this podcast and hope that there is great value for you too.